Cooking seems a lot easier when you can wander around the garden, pick what's ready to pick and then turn it into supper. Saturday night's haul included some onions (supposed to be for pickling, but they didn't get that far), carrots, zucchini, beans, spinach and broccoli. 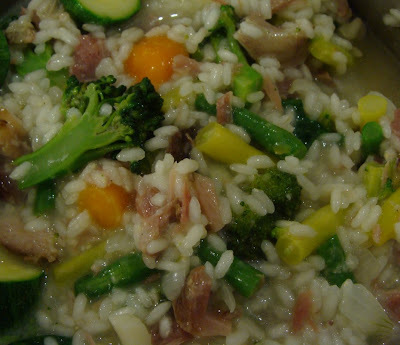 I had some leftover cooked ham and the stock that it was cooked in, so it seemed that a summer vegetable and ham risotto would be a perfect way of using all these things up. I melted some butter in a pan and gently cooked the chopped onions and some crushed garlic (not in the picture, but also from the garden!) until they were transparent. Then I stirred in the risotto rice and the sliced carrots. Once the rice was coated in the butter I gradually stirred in the stock, a little at a time, and adding the other vegetables at the appropriate moment. The rice takes about 20-25 minutes to cook, which is fine for the carrots and onions, but the other vegetables need less cooking time. I added the beans and broccoli when there were about 10 minutes to go, then the courgette/zucchini slices and the spinach with 5 minutes left. If you don't eat ham, then you could use a vegetable stock instead and perhaps replace the protein in the ham with some cheese stirred in or sprinkled over at the end of the cooking time. Summer on a plate: delicious! That does look delicious and a great use of the harvest. I had to laugh when you onions didn't make it to be pickled. I sometimes bring the harvest in and think it is going to be one thing and it turns out to be something else. Risotto is one of our absolute favorite things. It's probably one of the reason our daughters are such lovers of vegetables. With twins, we couldn't manage baby food and our food, so we just cooked what we could all eat -- and enjoy. Risotto was -- and is still -- big in our kitchen. YOURS looks delicious! 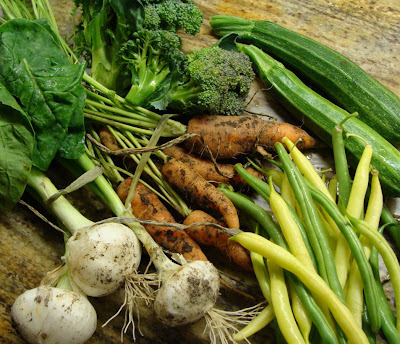 I love learning what other gardeners make of their harvest. That risotto looks great. I made a pea risotto when the peas were abundant. Such a versatility dish. Great harvest!